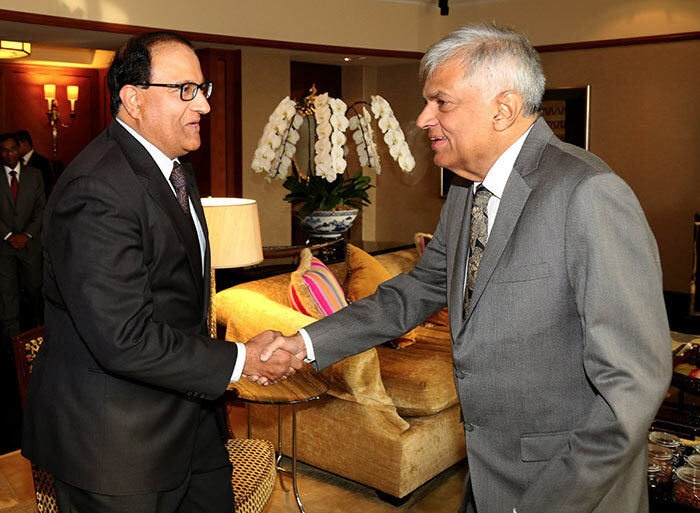 Prime Minister Ranil Wickremesinghe speaking at the Investors Forum in Singapore assured the international investor community that Sri Lanka was committed to forging ahead with its reforms agenda. He said Sri Lanka had put in place measures that would not only make it an attractive place to do business, but ensure that the country becomes the knowledge-based highly competitive economy it is poised to. “Sri Lanka is on the path of becoming an attractive place for business in South Asia, one of the fasted growing regions of the world,” the Premier said. “Sri Lanka as an island is increasingly becoming a vital player in the region enabling us to punch above our weight, a lesson we learnt from Singapore,” the Premier said. The Prime Minister reiterating further on the reform agenda said that Sri Lanka had taken numerous initiatives to stabilise and re-orient the economy. “Moving from a growth model dependent on debt-fuelled public infrastructure spending to an outward looking one driven by private enterprises, exports, and Foreign Direct Investments,”the Prime Minister said. The Prime Minister was delivering the Keynote Speech at the Investor Forum organised by the Colombo Stock Exchange, Securities and Exchange Commission of Sri Lanka and the Singapore Sri Lanka Business Association, held at the Four Seasons hotel in Singapore yesterday. Referring to the ease of doing business, the Premier revealed that by mid-2018, the time taken to register a new business will reduce from six days to just one day. Finding land and registering property will be halved from 51 days to 26 days, and the procedures reduced from nine steps to two steps. He elaborated further stating that they were introducing an ‘Electronic Single Window’ that would link dozens of state agencies dealing with international trade through a few clicks. “Through the new Colombo International Financial City, the present Port City project, we are creating a unique business climate that is globally-competitive. This new city will function as a special economic zone and have a conducive and transparent regulatory system. It will provide an environment for your companies like no other in this region.The enabling legislation is now in the preparatory stage. We plan to launch the gallery mid this year – you should visit,” the Prime Minister said. Prime Minister Wickremesinghe added that the government was complementing these efforts with comprehensive trade policy reforms. The Prime Minister also spoke on the possibility of closing in on two bilateral agreements, an Economic and Technology Cooperation Agreement with India which would deepen the existing FTA and a comprehensive FTA with China. “These agreements are an important part of the new ‘National Trade Policy’ launched last year, and are a linchpin in the ongoing trade policy reforms. They will add on to the advantage created by our access to the EU’s GSP+ facility. This means that through our preferential market access, any business located in Sri Lanka would be able to access nearly 3 billion people from Spain to China – we are probably one of the very few countries in the world that can claim this! This only adds on to our strategic geographical advantages – we are 1 hour from 5 fast-growing South Indian States, have quick access to the Bay of Bengal region, and only a few hours from South East Asia and the Middle East,”Prime Minister Wickremesinghe said. The Prime Minister mentioned about attracting more Belt and Road projects from China adding that they expect a lot of investor interest in the new Logistics and Industrial Zones near the southern port of Hambantota, which is being developed with Chinese investment. “Three other large industrial zones are being set up, including one in partnership with a private investor from Thailand. We also expect to develop tourist zones and domestic airports across the country, to facilitate the booming tourism industry. A key initiative on this front will be a highway connecting Hambantota in the South, Colombo, and Kandy in the centre of the country. A highly developed economic infrastructure system connecting two ports, two international airports, 3 major cities,” the Premier said. Referring to the macroeconomic front, the Prime Ministerhe added that when the Unity Government took over the economy in 2015, they had a challenging task where National debt had been mismanaged, and fiscal and monetary policy lacked discipline. “Since then, we have taken appropriate measures to build back our economy’s strength and resilience. We are very focused on fiscal consolidation, and the results are already visible – the tax to GDP ratio has improved, and ratings agencies are providing favourable outlooks. Next month, a new Inland Revenue Act will come into effect, providing a progressive, modern, and transparent income tax policy,” The Premier said.